The first, on December 21, departs Buenos Aires and cruises the Antarctic Peninsula, finishing in Ushuaia. The second departs Ushuaia January 6, 2013 for a round-trip cruise to the Falkland Islands and the Antractic Peninsula. The third departs Ushuaia January 17, 2013, and cruises the Antarctic Peninsula and Chilean Fjords before terminating in Valparaiso. The two January cruises can also be combined for a 26-night cruise that includes all of the the Falkland Islands, two visits to the Antarctic Peninsula and the Chilean Fjords. It is about forty years now since Hamburg had a cruise ship named after it, when German Atlantic Line operated a ship of the same name. 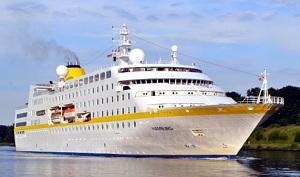 The last Hamburg was sold to the Black sea Shipping Company of Odessa and renamed Maxim Gorkiy. The Gorkiy was scrapped in 2009.